"Where I go for help" is a good question. I have used online resources, even paid for some, and hired a mentor, and turned to my blogging friends. Growing a blog is a lot of trial and error, and finding help is kind of the same. I hope you find my "mistakes" and recommendations to be helpful - and I look forward to reading everyone's thoughts on this topic. Also, if you have tips that you have found that work - please be sure to share them in the comments or email me. There are a lot of free resources out there for help, especially on Pinterest. If you are willing to take the time to look into them, you can probably find help on just about anything you want. I am collecting my resources from this series on a PINTEREST board - for quick access later. I am part of a blogging group called The Blended Blog. We communicate through Slack to share our tips, general comments, support, and a lot of conversation. 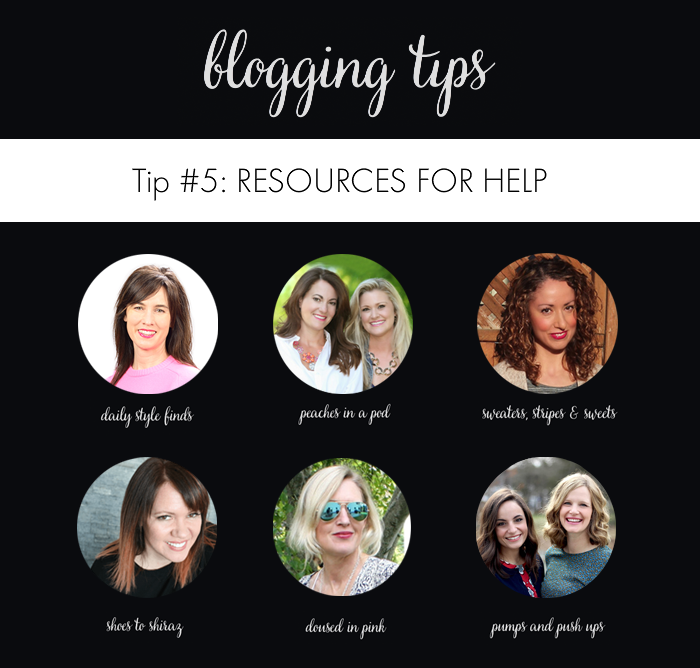 I have found my fellow bloggers to be one of the biggest resources for help. My recommendation is to find some internal blogging friends because you are both going through the same things - and can help mentor and guide each other. And, if you are thinking that helping each other would in some way compete with your own blog - you are wrong. I have only found other blogs to help grow mine! I really hate to admit this, but I got sucked in to online fast action gimmicks a couple of times! I signed up for these "free" webinars to help start/grow my blog, and then at the end of the session, the host offered the entire in-depth course (plus additional resources) for a reduced cost - but I had to sign up before the session ended. The one course I bought was a legal course, which I actually used. The Instagram course I bought I never really used. I do not have the time or patience to watch endless hours of videos - especially if they involve a lot of dancing/talking/singing and non-productive information. I prefer to read at my own pace on my own - and I should have known that when I signed up. What I found with these online courses was that there was a lot of common sense or things I could have found for free through blogs and other resources. I have found most of these to be a "get rich" quick scheme for the seller. The person hosting the class is making a lot of money - and in a sense "preying" on those who want to grow their blog or finds "new" ways to do something that will be the "magical" solution to growing a blog. I have never really found these courses to pan-out or make a difference. I think it is better to stick to your internal blog community and find "truly" free resources on your own. A couple of years ago, I hired someone to help me do some business planning. The mentor listened to my business ideas, and then tried to give some direction on the ones to pursue. I can't say I got a lot of specific help, but I did get some help with resources. I recently reached out to the person as a follow up to share some of the items I had put in to action that we had talked about; however, she was too busy with her own stuff to personally write back or even take a few minutes to look at some of the things I had implemented. Instead her assistant wrote back and said she didn't have any input - and she was busy writing her own book. I was a little turned off - and disappointed that she would not even take a few minutes - especially when she was the one that had told me to reach out to her when I had done the things we had talked about - so she could see. So, my advice - be really careful who you may find to mentor you - find out if they are there to really work with you - and help you - or if they are only there to make the money - and then move on to the next client. Also, check with your local and state governments - our state offers free business mentorship to small businesses. I have yet to check it out - but it is a great resource from what I have heard. Next, be sure to "hop" over to Marta at Sweaters, Stripes, and Sweets to hear her thoughts on how to find help with blogging. Such a helpful post Lisa, thanks for sharing all of these specific resources for help! That's too bad to hear about the negative experience you had with the "mentor", unfortunately there are plenty of people who are not genuine and/or willing to help but on the bright side you have an amazing network of support through The Blended Blog and also learned a good lesson. Thanks so much, Marta! The Blended Blog has been a great blessing and resource - and my other blogging friends, like you, too. These are helpful tips! It's disappointing to hear that some of those offering help are taking advantage of you. On the flipside, there are so many great bloggers out there that are supportive and helpful too! Pinterest is also my go-to! Thanks, Jill. I really appreciate your support of joining me in this series and for promoting my style series - you are a great blogging friend! Pinterest is such a great resource! Thanks! I need to use Pinterest more. Wow how disappointing that she wouldn't even look at what you did...how is she going to sell a book if she's not supporting those that helped her get there? Crazy! I need to use Pinterest more! Very specific and very helpful post! I will have to check out your links! Thanks for sharing! I've never paid for a course because I never know if they are legit or not! This is a great list. Thanks. Now, this is what I call sharing experience and a resourceful post! thank you for sharing! Such great advice...I think the thing that sticks out the most for me is that gimmick thing and people who are just calling themselves experts and then telling me things that I could have googled. I'll stick to my blogging friends! So many great tips & advice! Thank you! I pinned the post, and I'll check out the resources later! This has been such an informative series. I have all the best intentions when I sign up for "free" online blogging seminars but just have trouble carving out time every single day to do them. And you are right, there are so many great resources linked for us through Pinterest.